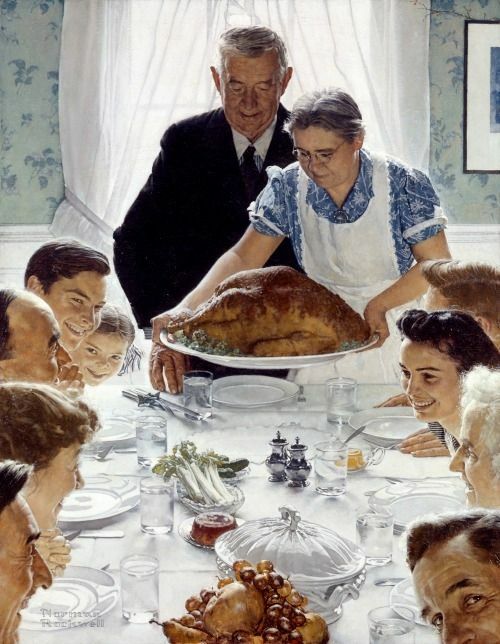 Although your family probably doesn’t look like Norman Rockwell’s 1942 depiction of Thanksgiving dinner (or lunch, as the sunlight coming through the window suggests), I hope you are having a very stuffed and happy Thanksgiving with your family and loved ones. Norman Rockwell’s Freedom from Want, 1942, from this online article. Borrowed from the Norman Rockwell Museum, Norman Rockwell Art Collection Trust. All Rights Reserved. Despite our nation’s turmoils and Thanksgiving allusions to our history of racial oppression and our embrace of excess, it is also a day of giving thanks and spending time with loved ones. I hope that you have people to spend Thanksgiving with and that you have food on your table. I enjoy cooking. I do so by instructing my personal care assistants what ingredients to use, how much, and how to cook in the manner I want. I am often experimental/creative with recipes and tend to use whatever ingredients I have around the kitchen; I like to think of it as the “Chopped”‘ Food Network style of cooking. Some may find my food peculiar. I inherited my Korean mother’s inability to provide measurements for recipes, so please bare with me. Here’s my stuffing recipe for 2014. Hydrate dried breadcrumbs (I cut up dried stale french bread, but any breadcrumbs works) and dried fruit (I used raisins, although I would have liked to use dried cranberries) with the broth from the turkey (or any stock would do) and I added a touch of apple cider in a bowl. Saute chopped nuts (I used walnuts, cashews, and almonds) in a pan of heated butter and rosemary. Remove after lightly toasted. Saute chopped onions, chopped and minced garlic, chopped mushrooms in the pan of heated butter, rosemary, and blended garlic and ginger. Add the hydrated breadcrumbs and dried fruit to the sauteed vegetables; cook on lower heat and mix. Fold in the sauteed chopped nuts. Add seasoning to taste. Try parmesan cheese instead of salt. Bake in the oven if the texture is too mushy. If you have any creative recipient feel free to share them in the comments below. From your Gimpy Law blogger. This entry was posted in Holidays and tagged "Chopped"' Food Network style of cooking, 1942, Happy Thanksgiving, Norman Rockwell's 1942 depiction of Thanksgiving, Norman Rockwell's Freedom from Want, Norman Rockwell's Thanksgiving, Savory/Semi-Sweet and Mushy/Crunchy Stuffing Recipe:, Stuffing Recipe. Bookmark the permalink.